After completing a course on "Revenge in Shakespeare," Maddie Swenson wasn’t ready to close the book on the Bard. "He has such a significant impact on English," she said. "Echoes of him are everywhere. I think without even knowing it, we hear a lot of the stories that he’s written today." 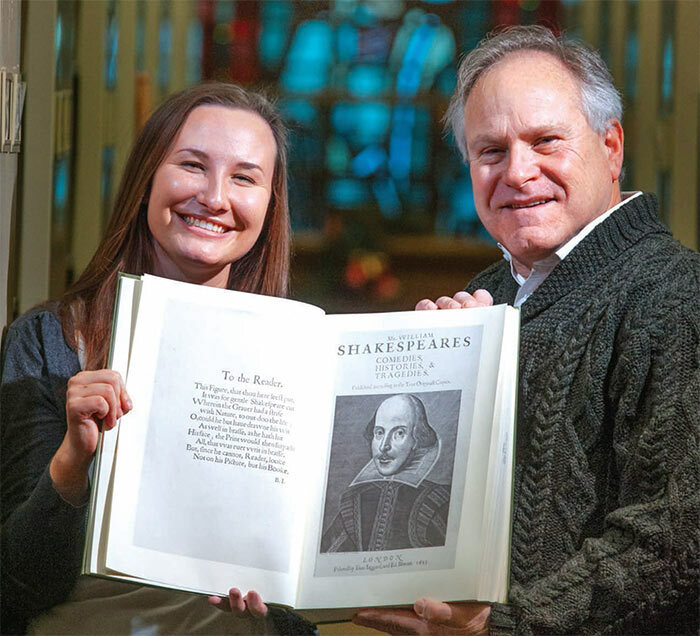 She approached her professor, Tom Zelman, Ph.D., about an independent study idea examining the power of female characters in Shakespeare’s plays. He readily agreed. "I love it that she gets this excited about the literature," Zelman said, "and this productive about the literature. She has a future in all of this. "It's just wonderful to have students like that." Swenson’s research ended up inspiring a follow-up project for Zelman, leading to the first-ever joint faculty/student School of Arts and Letters Colloquium and quite possibly changing Swenson’s career trajectory. Her project started with a question. She had noticed that Shakespeare’s strong female characters often lost their power by the end of the story. "How do these female characters find power and how do they lose it?" Swenson said. "How is it not the same as the male characters’ power?" In her paper, "Power Play: The Systematic Oppression of Shakespeare’s Commanding Females," Swenson examined the character arcs of, in her words: "shrewish Katherina from ‘The Taming of the Shrew’; appealing and often hilarious Beatrice from ‘Much Ado About Nothing’; eloquent and impressive Portia from ‘The Merchant of Venice’; and dynamic — and murderous — Lady Macbeth from ‘Macbeth.’"
She concluded that the female characters do have power at times, but it’s always limited. She writes, "For Shakespeare, you can be a wife or you can be a witch, but sadly, in the end, there is no in-between." Her paper concludes that only the witches of "Macbeth," the bearded "weird sisters" who don’t conform to gender roles, maintain true power: "In the end it is the witches, who reject these roles and constructs of femininity entirely, but accept their label, who succeed in cultivating their own unique power." Swenson’s conclusion sparked a research question for Zelman, who is interested in how writers draw inspiration from magic and the supernatural. He wondered why Shakespeare had chosen to include witches in "Macbeth" when they don’t appear in any of his other works. "The kind of conversations that I had with Maddie led me to think along different lines." Zelman began to research the history of witches during Shakespeare’s time. He decided to present his resulting research, "Shakespeare’s Weird Sisters: Black Magic Women?" during one of the SAL monthly colloquium events, and invited Swenson to participate as well. "It was cool that I got to be involved because I was involved in that thought process too," Swenson said. School of Arts and Letters Dean Tammy Ostrander, Ph.D., called the colloquium "an exceptional opportunity to showcase student research conducted in tandem with a faculty research project." "Maddie handled herself quite well, and her research was well received as was Tom’s," Ostrander said. "This type of presentation is exactly what is expected of a scholar pursuing a career in academia." Swenson enjoyed the chance to share the colloquium stage with her professor, and to discuss her research and thought process with so many respected faculty members. "It's a wonderful feeling," she said. "I get to play in the big leagues." An English Education major, she’s now contemplating attending graduate school after she gets her bachelor’s degree in May. Zelman has no doubt she could do well. "Anything she wants to do, she'll be good at," he said.